This quiz has ten problems: seven multiple choice, and three matching problems. Second grade students will practice counting to find the value of pennies, nickels, dimes, and quarters. They will also skip count and count on to determine the value of a group of coins. 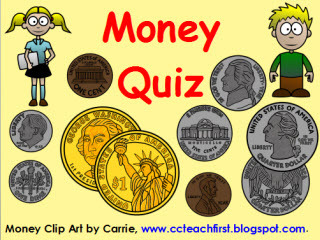 Return from this Money Quiz to the Elementary Math Tests , 2nd Grade Math Tests webpage, or to Math Tests.